Home / Collections / The Playful Dog! 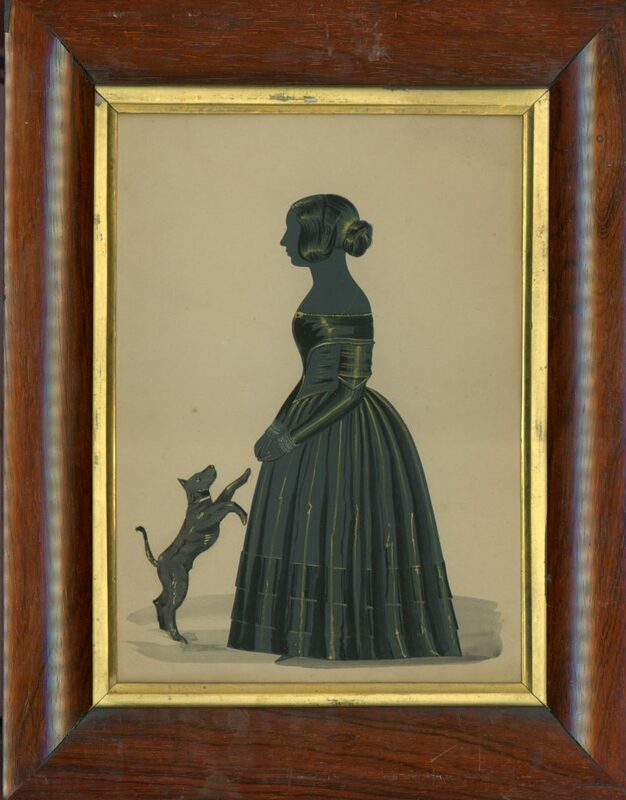 An attractive full-length cut and well-gilded silhouette of a demure young lady with her attention-seeking puppy. She is wearing a wide-shouldered evening gown with a pointed waistline, long narrow sleeves with lace cuffs highlighted with Chinese white, and a tiered skirt, her only jewellery being a small gold brooch on her corsage. 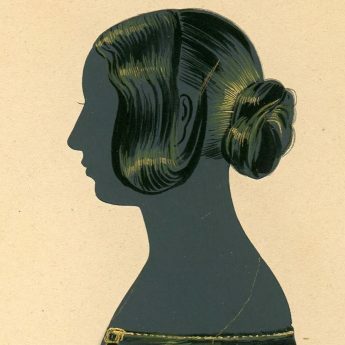 Her hair has been looped over her ears and drawn back into a twisted knot. 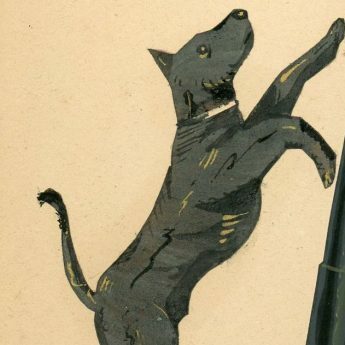 The artist has caught the eager excitement of the little dog that is jumping up for attention. 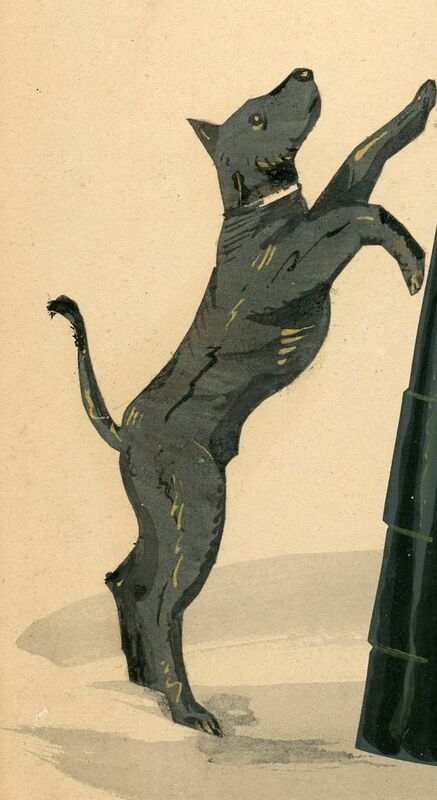 The silhouette is in fine condition (just one brown spot to the background card located over the dog’s head). It is housed in a period dark wood frame (small area of old loss to the veneer on the top left corner) with a gilt slip. Although unsigned, the colour and style of the gilding on this profile compares favourably with that on another signed Crowhurst silhouette. George Angelo Crowhurst worked mostly in and around the popular resort of Brighton between about 1827 and 1844. 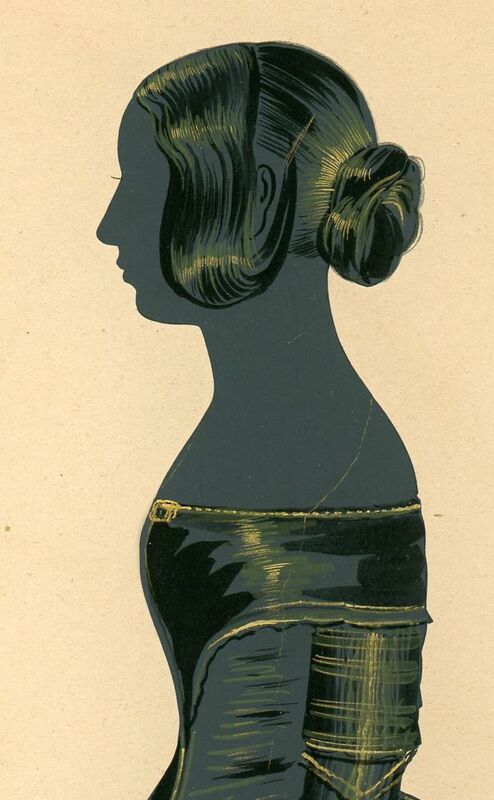 Some of his profiles were cut, others were painted; the use of small touches of colour is a known characteristic of his work.